How can services be designed to avoid data model transformation? Services with disparate models for similar data impose transformation requirements that increase development effort, design complexity, and runtime performance overhead. Data models for common information sets are standardized across service contracts within an inventory boundary. 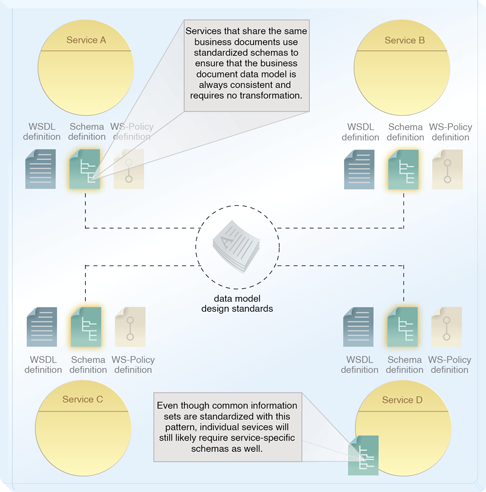 Design standards are applied to schemas used by service contracts as part of a formal design process. Maintaining the standardization of contract schemas can introduce significant governance effort and cultural challenges. Multiple services implemented as Web services have standardized XML schema definitions as a result of applying this pattern.